Compact Heat Exchangers for Energy Transfer Intensification: Low-Grade Heat and Fouling Mitigation not only highlights key developments in compact heat exchangers, but also instills a practical knowledge of the latest process integration and heat transfer enhancement methodologies. Jirí Jaromír Klemeš holds a D.Sc from the Hungarian Academy of Sciences, and Doctor Honoris Causa degrees from the Kharkiv State Polytechnic University, Ukraine; the University of Maribor, Slovenia; and the Politehnica University of Bucharest, Romania. Dr Klemeš is a Pólya professor and the Head of the Centre for Process Integration and Intensification—CPI2 at the University of Pannonia, Veszprém in Hungary. He worked previously for 20 years in the Department of Process Integration at the University of Manchester Institute of Science and Technology, UK, and after the merge with The University of Manchester, UK, as Senior Project Officer and Honorary Reader. He also ran research in mathematical modelling and neural network applications at the Chemical Engineering Department, University of Edinburgh, Scotland, and has been a Distinguished Visiting Professor at the Universiti Technologi Malaysia and Universiti Technologi Petronas in Malaysia, South China University of Technology, Guangzhou, Tianjin University, Jiaotong Xi’an University and Guangdong University of Petrochemical Technology, Maoming in China, University of Maribor in Slovenia, and Brno University of Technology in the Czech Republic. He has unique success record in managing and coordinating research projects funded by the European Community FP2 to 7, UK Know How Fund, NATO High Technology, European Training Foundation, and others. He is an editor of several scientific journals, and has authored and edited numerous books. He founded and has been since the president of the International Conference Process Integration, Mathematical Modelling and Optimisation for Energy Saving and Pollution reduction — PRES (www.conferencepres.com), and is Chair of the CAPE Working Party of the European Federation of Chemical Engineering. Olga P. Arsenyeva is an Associate Professor in the Department of Integrated Technologies, Processes and Apparatuses at the National Technical University "Kharkiv Polytechnic Institute" (NTU KhPI), Ukraine. She graduated from the Kharkiv State Polytechnic University, Ukraine, and worked for the Centre for Energy Saving Process Integration (CESPI) at NTU KhPI, which was founded following the program for British Council Training and Academic Link, where she did her Ph.D under the supervision of Professor Leonid Tovazhnyianskyy. In 2005, she joined Professor Petro Kapustenko in the AO ‘Spivdruzhnist-T’ Engineering Company, Kharkiv, Ukraine. Both CESPI and AO ‘Spivdruzhnist-T’ had close relations with the Department of Process Integration at the University of Manchester Institute of Science and Technology, UK, and the Centre for Process Integration and Intensification—CPI2 at the University of Pannonia, Veszprém, Hungary. In 2014, Professor Arsenyeva was awarded her D.Sc from NTU KhPI. Petro O. Kapustenko is a Professor and the Deputy Head of the Centre for Energy Saving Process Integration (CESPI) at the National Technical University "Kharkiv Polytechnic Institute" (NTU KhPI), Ukraine, founded with the support of the Department of Process Integration at the University of Manchester Institute of Science and Technology, UK under British Council Know How Link project. He graduated from NTU KhPI, earned his PhD from the D. Mendeleev University of Chemical Technology of Russia in Moscow, and cofounded Spivdruzhnist-T Engineering Company, Kharkiv, Ukraine, eventually becoming its chief executive officer. The company has been involved in a number of projects funded by the European Commission and the World Bank aimed at the renovation of district heating networks and industry using process integration methods. The company implemented advanced energy saving equipment including combined heat and power units, compact heat exchangers, heat pumps, modern district heating substations, and others, mostly in the Ukraine and the Russian Federation. Professor Kapustenko is also member of the Ukrainian Building Construction Academy and Ukraine representative at CAPE Working Party of the European Federation of Chemical Engineering. Leonid L. Tovazhnyanskyy is a Professor and the Head of the Department of Integrated Technologies, Processes, and Apparatuses at the National Technical University "Kharkiv Polytechnic Institute" (NTU KhPI), Ukraine. He graduated in 1959 from the Kharkiv V.I. Lenin Polytechnic Institute in the former Soviet Union, and in 1966 was awarded a PhD In 1988, he received his DSc from the D. Mendeleev University of Chemical Technology of Russia in Moscow. Since 1995, he has been the director of the Centre for Energy Saving Integrated Processes, and in 2000 he became the rector of the NTU KhPI and served several terms. His research interests are heat and mass transfer processes in channels of complicated geometry, including various types of channels with corrugated walls, for industrial plate heat exchangers, optimisation of heat exchanger networks, and process integration. He has extensive experience in implementation of modern energy saving technologies and Plate Heat Exchangers in chemical and other industries. Professor Tovazhnyanskyy is corresponding member of the Ukrainian National Science Academy. 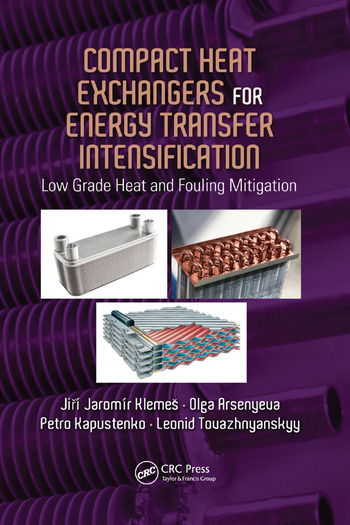 "This text encompasses all the important features associated with the successful design and implementation of many types of compact heat exchangers in a wide variety of potentially demanding and valuable applications—the emphasis on fouling mitigation, uses in heat pumping and power cycles, and process integration gives the book a unique flavour that will ensure its value across a wide readership."